After two seasons where Admiral got to the playoffs, the Seamen had the worst season in their history. KHL.ru keeps on reviewing the 2017/2018 season. The Seamen started the new season with a new wave of optimism. In the 2016/2017 playoffs the team fought hard against Avangard and had a very good showing. Moreover, the team managed to retain both the leaders and the coaching staff. However, the hopes for the third straight Gagarin Cup playoffs run flew away quite fast and as a result the team went into full rebuilding mode. During the season, Admiral not only was one of the last teams in the standings, but also amassed debts toward players. The team started the season with a seven-game away tour, but the first win happened only in the fifth game, against Traktor in Chelyabinsk (3:2). In spite of the results, the team led by then-head coach Alexander Andrievsky showed a good hockey and, in many occasions, the Seamen seemed on the verge of getting three points from the away games. Going on, it was even better. In the home tour, Admiral had a good series with wins over Slovan and CSKA, and games with points against Jokerit and Vityaz. On September 21, in Moscow, the Seamen played one of their best games, losing to Spartak 6:7 allowing the game-winning goal at only one second to the horn. However, the next home series was much less successful. Admiral lost three out of four home games, and after losing to Lada (0:2) and Metallurg, Andrievsky left the team. The boards assigned the temporary head coach position to Fredrik Stillman, who was working in the team as a defensive assistant to Andrievsky. The team started having good results, and Stillman was confirmed as a head coach. Under Stillman, the team alternated wins and defeats, but still displayed decent hockey. The Far East team had a few very good games, for example on October 31 against Salavat Yulaev (5:1) or on November 2 against HC Sochi (4:0). However, close to the end of 2017, the team started amassing debts toward players as the team changed hands. All this happened during a six-game losing streak at home. This streak put an end to the playoffs hopes of the club. Leading players started leaving Admiral. In the first game after the trades deadline, the Seamen didn’t count anymore on Vladimir Tkachyov, Jonathon Blum, Ivan Nalimov, Robert Sabolic, and many other players. On December 28, Andrei Razin was announced as new head coach. But it didn’t last long. The famed coach worked in Vladivostok for a bit more than two weeks, winning three games out of five, but on January 14, Razin’s departure was announced. The coach and the boards exchanged some comments through the Internet, and on January 16 Admiral finally lost any playoffs hope. Without going into the details of Razin’s early departure from Vladivostok, the facts remain facts: the team finished the season with Oleg Leontyev as temporary head coach, and the Seamen had four different coaches in just one season: a sad way to establish a new KHL record. However, the team managed to have a good finish of the year, as in the very last game the Seamen defeated their regional rivals Amur Khabarovsk, in a game without much meaning for them, but with an enormous value for the Tigers. 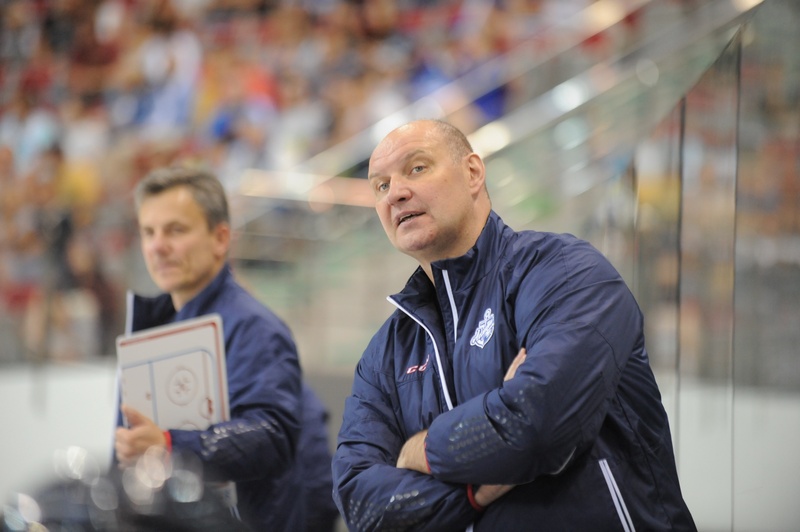 On September 15, in Vladivostok, Admiral interrupted CSKA’s ten-game winning streak. At the first intermission, the teams were tied 1:1 with goals coming from Maxim Kazakov and Sergei Shumakov, the latter scored at just two seconds to the first period’s horn. At the start of the second period, Vadim Krasnoslobodtsev and Vladimir Tkachyov scored to quick goals giving the Seamen a well-deserved lead. In this game, Ilya Sorokin was replaced during a game for the first time during his stint with CSKA Moscow. In spite of all the difficulties the team had during the season, it’s hard to choose a game where Admiral had a true bad showing. The first game of the season against Spartak was a very good one, but in the second game, in Vladivostok, the guests dominated. The Seamen played with only three lines and lost 2:6, with a double coming from Anatoly Nikontsev and a great goal scored by Alexander Khokhlachyov. 32-year-old Viktor Alexandrov missed the 2014/2015 season, then Admiral gave him a chance to get back to the big hockey scene. In the 2017/2018 regular season he scored more or less the same as the previous two years. Alexandrov became a true leader of the team, as much as Vladimir Tkachyov and Robert Sabolic. As already mentioned, the team showed decent hockey, in spite of the results, and almost all the players didn’t disappoint too much. Maxim Kazakov, however, didn’t have the best season. Every fan remembers how great he looked in Novokuznetsk on a line with Ryan Stoa and Kirill Kaprizov. In Admiral, he didn’t have a great regular season last year, but he scored five goals in the playoffs series against Avangard. The 2017/2018 regular season was similar to the 2016/2017 one, and in spite of the low competition for a spot in the roster, Kazakov didn’t manage to become a true leader.